After nearly two years of documenting their community’s rich architectural history, the residents of Midland, Michigan, are welcoming visitors from across the globe to experience the midcentury-modern oasis they call home. Palm Springs, California; Pittsburgh, Pennsylvania; Columbus, Indiana—there is no doubt these cities are some of America’s most visited areas when it comes to astonishing architecture. However, another architectural destination—though not as well known—is the charming city of Midland, Michigan, about 100 miles north of Detroit. Neatly tucked in Northwest Midland, this eclectic residence was designed in the 1960s by Robert E. Schwartz, a student of Buckminster Fuller. 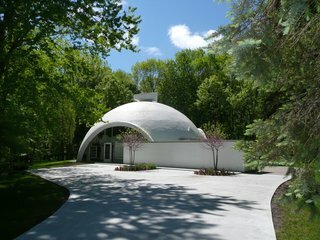 Commonly known as the Dome Home, the shell of the house was made from a spiral-generated styrofoam constructed with Dow Chemical technology. Celebrated by national publications such as the Chicago Reader and even our own Dwell Magazine, it was the extraordinary vision and renown craftsmanship of Alden Ball Dow, F.A.I.A. that first put Midland on the architectural map. 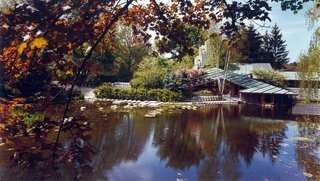 After studying at Columbia University and working under Frank Lloyd Wright as a Taliesin Fellow, Dow—the Architect Laureate of the State of Michigan—developed his own definition of organic architecture and created over 600 projects throughout his 50-year career. A peek inside Robert E. Schwartz’s Dome Home. Thanks to the open layout and floor-to-ceiling glass windows, natural light seamlessly floods this authentic midcentury modern abode. Along with his own residence, Robert E. Schwartz designed a number of structures throughout the city, including the Community Drug Store and Midland’s United Church of Christ. Inspired by Dow’s innovation and creativity, numerous other talented architects of the same era soon flocked to this hub of design to expand the city’s unprecedented midcentury modern portfolio. As a result, there are over 400 midcentury modern structures throughout this science-focused community. While Dow has the most documented work with 114 structures in Midland, 38 other architects and an additional eight designers and/or engineers have at least one documented structure throughout the area. 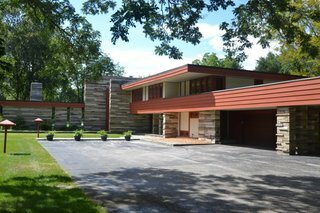 "What differentiates Midland is the unbelievable number and quality of these structures that create a cohesive expression of Modernism in the Midwest," states Craig McDonald, director of the Alden B. Dow Home & Studio—an education and research center based out of Dow’s historic home. Taking inspiration from nature, Japanese art, and his own philosophy which he called "A Way of Life Cycle," Dow thoughtfully designed what would be his own home and office during the 1930s. 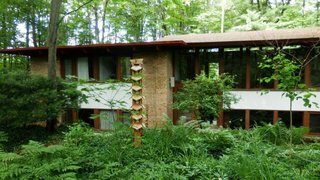 Today, this midcentury modern masterpiece is a National Historic Landmark and serves as the headquarters for the Alden B. Dow Home & Studio. To illustrate this cohesiveness, Mid-Century Modern Midland—a project of the Alden B. Dow Home and Studio—has dedicated the last two years tirelessly identifying and documenting the city’s substantial collection of midcentury modern architecture. With the assistance of 30 community volunteers, the entire 36 square miles of the city and its 18,000 structures were canvassed, and a total of 893 structures were submitted for consideration. Once an established review committee confirmed that over 400 of the buildings were certified as midcentury design, the team behind Mid-Century Modern Midland set out to document the architects, builders, and original owners, as well as the years each structure was built. Much of this was research was conducted through the City of Midland Building Department. A look at the Gilbert A. Currie Home by Glenn Beach. The acclaimed architect brought forth his unique background working with stone to create a dynamic, horizontally focused residence for the Currie Family. This midcentury structure is one of hundreds that can be seen via self-guided tours in Midland. "We learned so much about these amazing structures and the people who designed, built, and lived in them, and will continue to refine and document these buildings as we move forward," says Carol Neff, the coordinator behind the Mid-Century Modern Midland project. "This process not only documents the fascinating design evolution in the area, but also raises awareness of Midland’s unique architectural heritage." One of the most exciting elements of this project has been the commitment and engagement of the community. "It has been amazing how many people want to be a part of this program and history," McDonald notes. In fact, the project quickly expanded beyond city limits as people from New York, Georgia, and Colorado who grew up in Midland have even called in to assist. "When you grow up and live in Midland, the midcentury modern legacy is part of your heritage." After nearly two years of canvassing and screening 18,000 structures across Midland, an army of volunteers has identified hundreds of authentic midcentury modern designs, including the Richard Lane Home (pictured) by Frances Warner. Today, visitors can experience the city’s rich architectural history through the numerous events put on by Mid-Century Modern Midland, and even embark on self-guided tours via the organization’s free downloadable app. The culmination of this work is illustrated through the MCMM website, where viewers can read about each of the 421 midcentury structures that have been identified and documented thus far. The organization has additionally launched a free mobile app, which allows the same exploration as the website, as well as the access to pre-determined tours in the area. Visitors can also create their own self-guided tours based on customizable filters, such as specific architects and types of structures. So if you’re looking to see an unparalleled collection of midcentury modern architecture in an accessible, interesting community, consider a trip to this extraordinary hidden gem of Midland as your next destination. To learn more about the organization that is making Midland the midwest mecca of midcentury architecture, please visit the MCMM website at www.midcenturymidland.org. 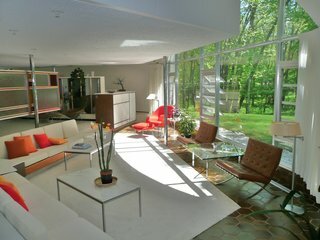 You can also download the group’s free app, mid-century modern midland, at the Apple App Store or Google PlayStore.